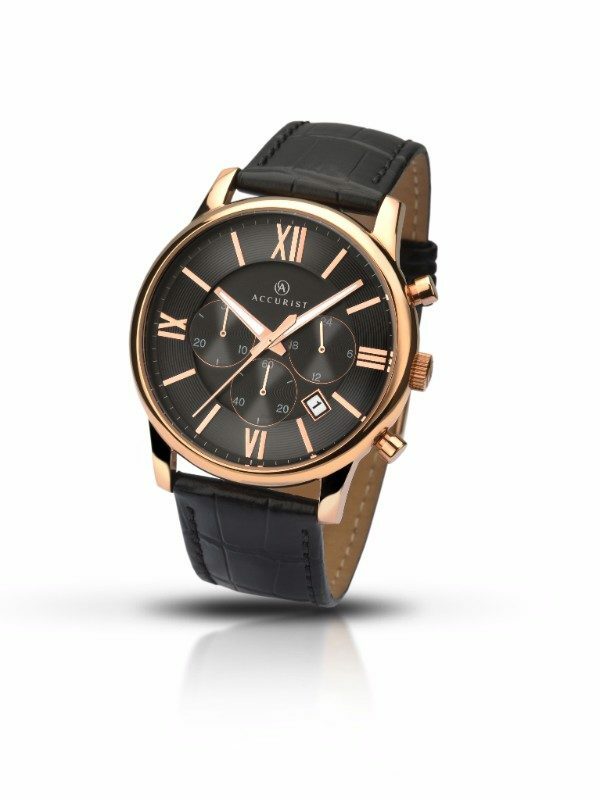 A smart and stylish chronograph watch from Accurist featuring a striking black sunray dial with date display, complementary rose gold plated stainless steel case, black leather strap and water resistance of up to 50m. This watch is the perfect finishing touch for any occasion. English watch manufacturer Accurist has made itself a household name thanks to its production of high-quality, attractive wrist wear. Accurist creates watches for men and women, providing options for a variety of style preferences. Almost exclusively analogue, the collection includes everything from vintage to ultra-modern designs, with beautiful faces featured on leather and metallic bracelets. The women’s watches are nothing short of stunning. Delicate and innovative bracelets are encrusted with stones to catch the light and add timeless glamour to your outfit. More easily wearable and practical daily pieces are also available, made with the standard and quality you’ve come to expect from the brand. Men’s watches are equally beautifully designed, with subtle masculine features creating a timeless look in silver and yellow gold. An Accurist watch is a keepsake you or a loved one will treasure for years to come. Find your new favourite watch by browsing the full collection.